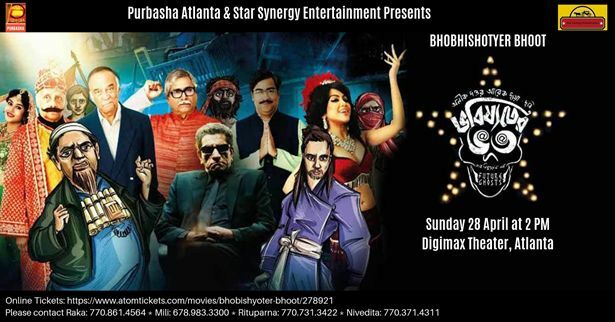 This brand new Bengali movie "Bhobishotyer Bhoot" will be premiered in Atlanta (w/ English subtitles) and is brought to you by Purbasha & Start Synergy Entertainment. The story is about Ghosts who are rendered homeless as all the old haunted buildings in Kolkata have been converted into multi-storied buildings, malls and multiplexes. Their very existence is at stake. Some of them, from varied social-economic background, take shelter is a disused dilapidated single-screen theatre. They plan to make themselves relevant and fit for the future as contemporary ghosts. This is a scathing political satire, full of fun, music and action. 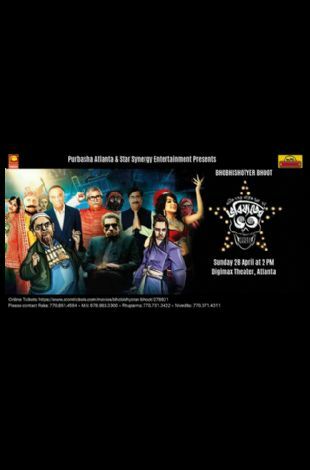 Stars: Sabyasachi Chakraborty, Kaushik Sen, Moonmoon Sen, Chandreyee Ghosh, Paran Bandyopadhyay, Barun Chanda, Badsha Maitra and Sumanta Mukherjee. Please reserve a ticket at the earliest as seats are limited.